Have users mine Monero XMR while they watch your YouTube videos with VidYen VidHash!steemCreated with Sketch. 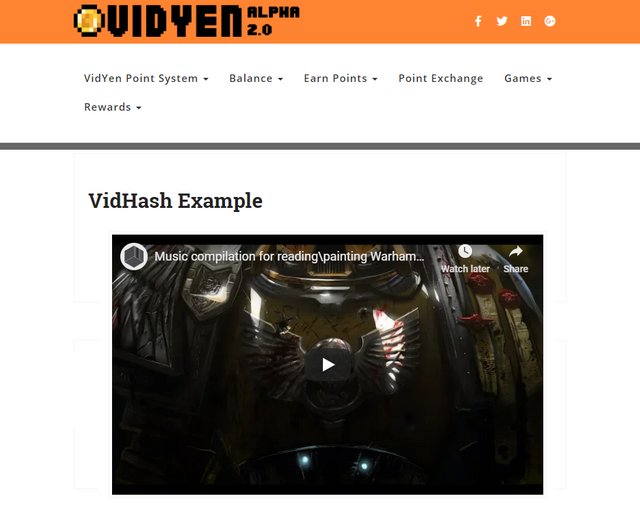 VidYen VidHash is a Monero browser miner plugin which mines while the user is watching an embedded YouTube video on your website. Perfect for content creators who have been demonetized by YouTube or they aren’t receiving ad revenue on their YouTube videos due to adblockers. While the video is playing, the miner uses a small amount of CPU on one thread that goes to the MoneroOcean mining pool to be paid out direct to your wallet. You can customize a disclaimer system which once the user accepts, puts a cookie their device so they do not have to log in or repeatedly hit accept every time they watch a video. Disclaimer can be localized for languages other than English. Tie in to VYPS for user tracking. Vimeo and other video site formats. Multiple tabs do not work and prior must be closed. Basically you just need WordPress, a Monero wallet, and some YouTube video urls to embed on your site. While the video is playing, it mines a small amount of XMR. If the user hits pause, it will pause the mining so user controls are there. I did not set to crank up to 100% by default nor put controls beyond simply hitting the pause and play button, as I think this should be non-intrusive to the user as if they were watching a regular YouTube video. Now of course this is no where as efficient as GPU mining, but if you have been demonetized off YouTube or just have a lot of followers who would do this, you can mine XMR that way. So even though it blocks the YouTube ads, it still mines XMR. And will save a cookie so they don't have to click agree everytime they watch a video on your site with this. Now I do get a 10% and MO gets his pool fees, but generally its way better than Coinhive I suppose. Some known bugs... Only work in one tab at a time. Multiple videos on same page have some issues. And Brave browser will pause a video if you switch tabs. This is an intended feature on their part the way they handle browser mining. Any questions. Feel free to ask!